Royal Air Force Charitable Trust Enterprises - News: Booking is Now Open for the Official Air Tattoo Campsite! Home » The Airshow » Visiting the Show » Latest News » News: Booking is Now Open for the Official Air Tattoo Campsite! Booking is Now Open for the Official Air Tattoo Campsite! We're delighted to announce that booking is now OPEN for the Official Air Tattoo Campsite. Provided by Tangerine Fields, two camping options will be available: either bring your own tent or book from a selection of pre-pitched options! 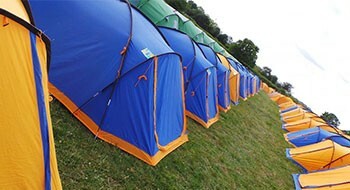 The campsite will operate from 17 July to 22 July! There's no minimum night stay and under 18s are FREE to camp with an adult camper! Located on the opposite side of the road to the Red Car Park, the campsite is in a perfect location to visit the Air Tattoo. It's only a ten minute walk where you will enter via the Yellow Pedestrian Customer entry point. It's time to 'pitch up' for a great weekend!